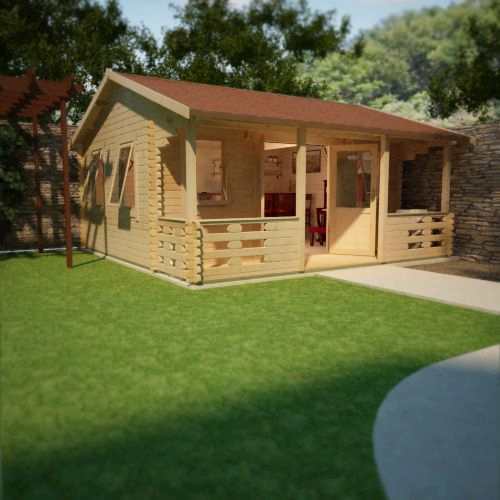 The Sigma 44mm thick Log Cabin incorporates a large 4ft (approx.) deep veranda in its unique yet fantastic design, making it an amazing garden retreat for those hot summer days. A great product at a great price. 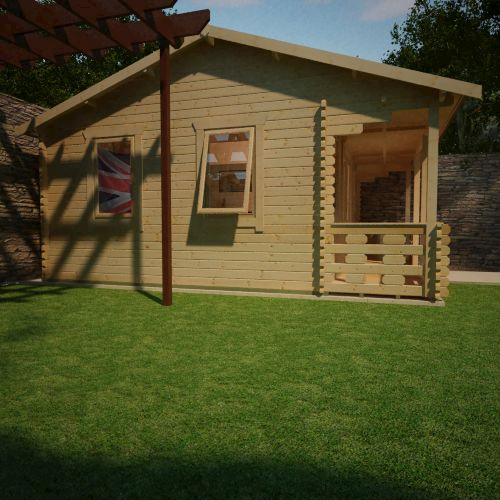 I am building six large houses at present and will recommend using Tiger Sheds to all my clients. 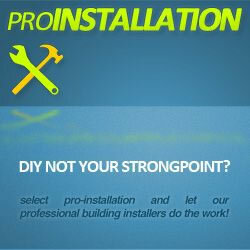 Your installer Alan was extremely helpful and an absolute credit to you. Generally we are very happy with our log cabin purchase. The timber and machined finish of the logs is of excellent quality and we feel that we have had very good value for money. We were first attracted to owning a log cabin having seen a display of some at a nearby timber merchants. However, the price was off putting and so after looking on-line we came upon the Tiger sheds range. We were particularly impressed with the Sigma cabin and thought the quality of the windows and doors was superior to the finish we had seen with the competitor display ones. We found the website to be very clear and even though it was a bit risky ordering without seeing directly but we went for it and am well pleased that we did. We did have some relatively minor problems, though, and probably a 4 ½ rating would have been fairer than the 5 given. Because of planning requirements we reluctantly opted for the reduced height version and found that some of the items provided (such as the facial boards) were for the standard height version so they requiredmodifying. However, these problems were overcome and we are well pleased with the final result. Great cabin had larger 30 ft by 20ft made - great value - all as agreed - had it erected by Tiger Sheds in a couple of days in the depths of winter! Great product and worth every penny! We love it and can't wait to use it for parties over Christmas :) Thank you Tiger Sheds! Very happy customer. I first started researching log cabins about 1 year ago. After a lengthy internet trawl I kept coming back to TS. The attraction for me was the 44mm log and the way it interlocked. Upon return to the UK I ordered up, the internet platform was great, options were easily followed, funds transferred and confirmation ped into your inbox as you expect. Plenty of notice when delivery was due. I've spent the last 4 days building the cabin with my wife and have enjoyed it tremendously. You have to get the foundations set and do need to get them level however, that goes for all construction projects so nothing new here. The material arrived well wrapped, well packed and in good order. The delivery driver gave me a quick run down on areas I may need to pay attention to, efficiently offloaded and headed off to his next job. Minor points of irritation, the way its packed on the pallet. The floor components are at the bottom so... you have to offload everything else to get to the first piece you need. I suppose you could say this is good as it allows you to familiarize yourself with the jigsaw pieces. The wood comes untreated so plan to have heavy duty plastic to lay the wood on and to cover it with otherwise it can take dirt and discolor. Forewarned is forearmed. The floor pieces go in well, take time with those and you are off and running. I'm no joiner but I was surprised how well things fitted together. 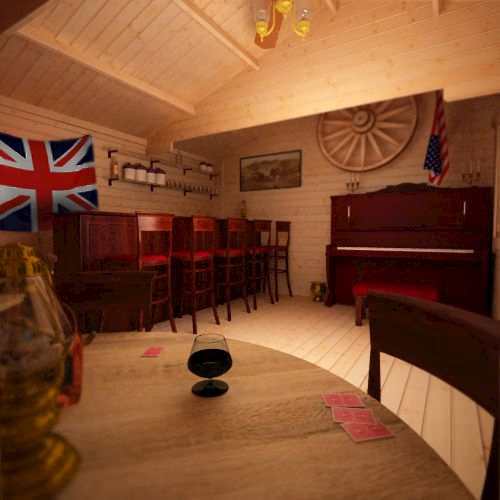 The tiger shed team have made the shed so well there is limited room for amateur error. The one area that I would say does need work on.... the instructions are not good. They are all there but you end up squinting over an A4 piece of paper trying to count small lines with a small pen in fading light. 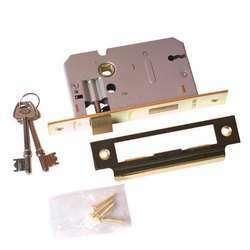 To end on a high note as this product is extremely good value and extremely well made. If my garden was bigger I would order another, the joiners who are working on my garage extension want to start shipping them up to Scotland, the neighbours are nosing and my BMW GS1200 is looking forward to its new home. Thank-you to the team for taking the time to build a cracking log cabin and the support team for getting it up to me. A very happy customer. The cabin is well built and the men who constructed it were very good. My main criticism is that the builders left all their rubbish here the large pallet it came on (what am I meant to do with it) and all the packaging which took me 2 trips to the tip to get rid of. Defo buy from Tiger Sheds!!!! if you're looking for excellent quality, top customer service and fast delivery then it's perfect for you! Very happy customer!! 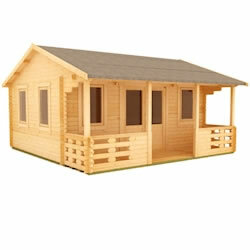 The Sigma 44mm thick Log Cabin incorporates a large 4ft(approx.) deep veranda in its unique yet fantastic design, making it an amazing garden retreat for those hot summer days. 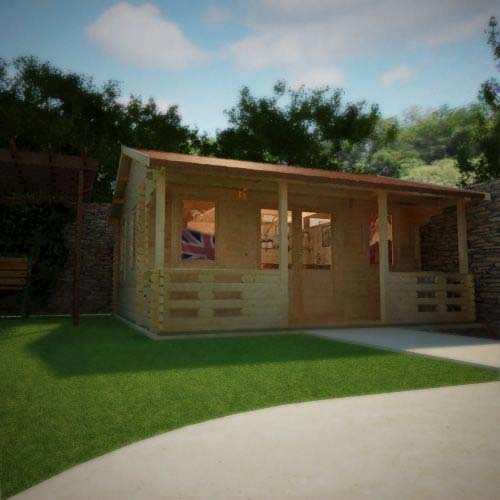 Ideal to relax on or equally to shelter from the rain and storms, this veranda area complete with roof overhang really could be the log cabin for you. The Sigma log cabin also incorporates a large internal storage shelf above the veranda - superb for keeping things tucked out of sight. 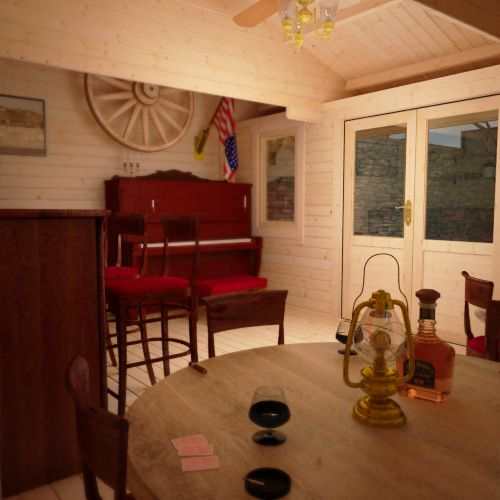 Made with superb high grade European softwood, this excellent high quality wooden log cabin has half glazed draft sealed double doors and glazed and draft sealed windows as standard, with options to upgrade should you want to add even more luxury to your new log cabin. 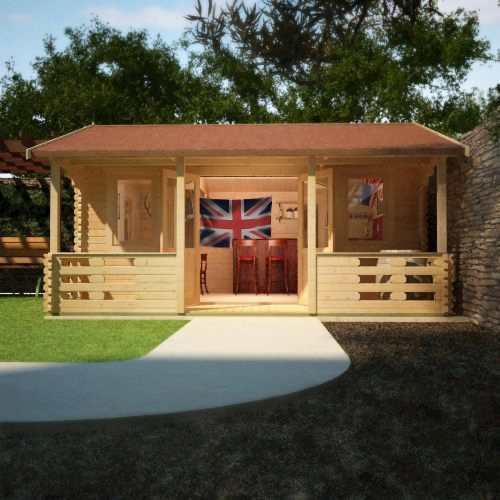 Suitable for a range of purposes, the Sigma Log Cabin can be used as extra storage, an outdoor gym, a spare room, an office, and plenty more. The only limitation is your imagination. 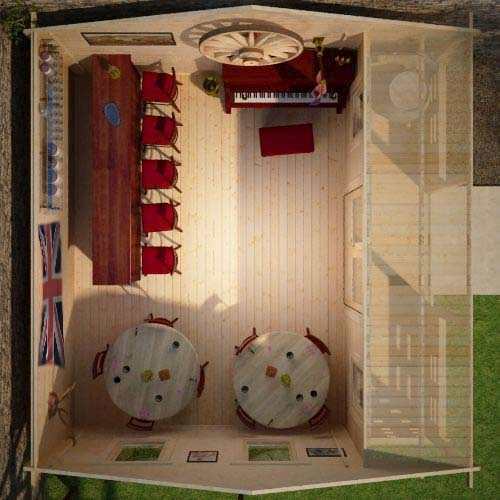 If you want to discuss any bespoke configurations on the Sigma log cabin give a member of our sales team a call on 0113 205 4189. 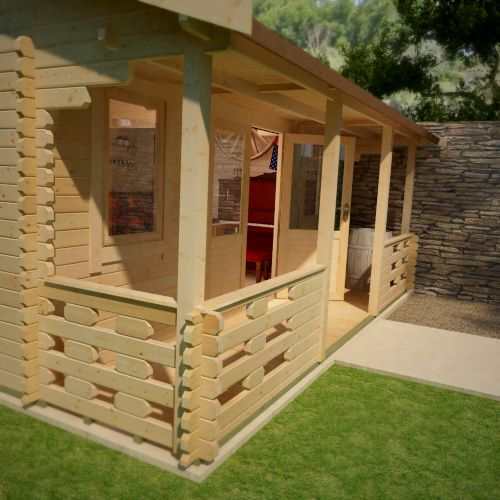 SIGMA LOG CABINS feature high-grade 44mm interlocking planned and finished logs – beware of log cabins that feature rough edged boards machined from poor quality timber. SIGMA LOG CABINS feature a specially designed 4-way chamfered notch-joint system ensuring a tight fit to all boards with little room for damp or wind penetration – beware of log cabins that feature square cut logs with square notch-joint, often leaving a sloppy joint with large visible gaps. SIGMA LOG CABINS feature factory fitted pressure treated weatherproof heavy duty floor joists – beware of log cabins with untreated floor joists which offer no protection against damp penetration at floor level or worse still cabins that come with no floor joists at all. SIGMA LOG CABINS feature heavy duty green mineral roofing felt as standard, with the easy option to upgrade to premium quality roof shingles – beware of log cabins that come with no roof covering, leaving the log cabin completely open to the elements. SIGMA LOG CABINS feature oversized extra large doors and windows – most competitor log cabins use narrow doors which can prove difficult for access. SIGMA LOG CABINS feature key-lockable opening windows and all doors and windows are professionally draft sealed – beware of cheap, ill-fitting doors and windows that cannot be properly secured and are susceptible to the weather. SIGMA LOG CABINS feature high quality glazing which is factory silliconed and internally beaded to all doors and windows – beware of log cabins that feature lesser quality materials and provide no window beading. 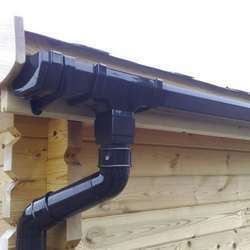 SIGMA LOG CABINS feature a generous all round roof overhang which protects the building from severe conditions – beware of log cabins with little or no roof overhanging leaving them vulnerable to the wind and rain.